i forgot to buy the z-axis kit. Does somebody know if i can buy the motor somewhere in Europe. Ups is pretty expensive if I order from the US. Also directly from China would be good. I want to say I saw @Dag83 post something about selling zaxis kits but I don’t remember exactly what was In the kit. No, the motor is not included in my kit. It is just a way to attach the standard z-axis motor to the bosch pof 1200. I have seen some posts around here of the motor on amazon or ebay or something. Does a Bosch pof 1400 also works? I bought that one now. Can you point me to that links? The 1200 and the 1400 should be almost the same internally, you still have to take it apart though to remove some restrictions and install the nut mount. 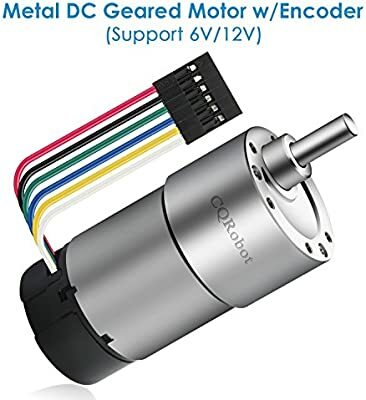 Hi, can anyone tell me / teach me what or how to determine the z-axis encoder steps per revolution for this motor w encoder? It’s quite inexpensive but the quality is not bad. Haven’t tested much yet. It has an adjusting mechanism very similar to the Bosch BOF. It’s possible to install a z axis motor in the same manner as being used in the Bosch BOF. Furthermore, handles come out without the need to cut. I didn’t check if it’s the same size as the one in the kit. Speed is not the same. I wanted to buy a slightly faster motor. You might want to put a fuse or such on that motor since it has such a high stall current. Wouldn’t want to blow a driver if it reaches a limit. signifcantly lower, and that will be a drastic limit on the machne capablity. Here I also found the motor on aliexpress. These motors from maslow have 6 cables right? I’m from Belgium, Europe, and me too, I don’t have a z-axis motor on my Maslow Machine, and would want to buy one. Apparently in the Maslow store it is not available, unfortunately , as a separate part. I saw some links in this topic on ebay and Amazon.com, but not realy sure if it is the correct , compatible motor. Is there someone here that can point me to a source please? Preferably a tested version, if possible, or clear specs. I’ve been using this motor in my Z axis with no problem. We will be selling z-axis kits on makermadecnc.com soon. We are also setting up a shipping location in Germany to help get products to everyone in Europe faster. Lots of fun stuff in the works. Do you have any new information regarding the shipping location in Germany? Still working through some importation laws with Germany. We will have z-axis kits live on our site today though. International orders will ship from China and US orders will ship from Arkansas.